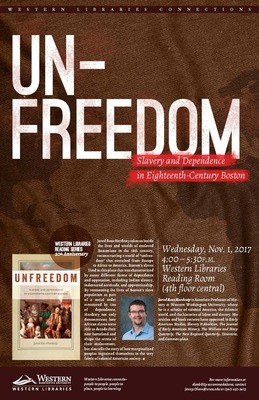 Western Washington University Associate Professor of History Jared Ross Hardesty discussed his recent book, Unfreedom: Slavery and Dependence in Eighteenth-Century Boston, (New York: NYU Press, 2016) on Wednesday, November 1, 2017 from 4:00 p.m. to 5:30 p.m. in the Western Libraries Reading Room (Wilson Library 4th Floor Central). Hardesty’s talk explored the lives and worlds of enslaved Bostonians in the eighteenth century, reconstructing a world of "unfreedom" that stretched from Europe to Africa to America. Boston’s slaves lived in this place that was characterized by many different forms of dependence and oppression, including Indian slavery, indentured servitude, and apprenticeship. By reassessing the lives of Boston’s slave population as part of a social order structured by ties of dependence, Hardesty not only demonstrates how African slaves were able to decode their new homeland and shape the terms of their enslavement, but also tells the story of how marginalized peoples ingrained themselves in the very fabric of colonial American society. Hardesty is Associate Professor of History at Western Washington University, where he is a scholar of colonial America, the Atlantic world, and the histories of labor and slavery. His articles and book reviews have appeared in Early American Studies, Slavery & Abolition, The Journal of Early American History, The William and Mary Quarterly, The New England Quarterly, Itinerario, and Common-place. Beyond his publications, Hardesty’s work has been recognized with grants and fellowships, and he is currently working on a monograph exploring the intersection of labor and empire in the early modern Atlantic world. This special talk was offered as part of the Western Libraries Reading Series, which began in 1997 and is now celebrating its 20th anniversary! The Western Libraries Reading Series is dedicated to showcasing the scholarly and creative work of Western faculty and staff by featuring diverse speakers from a variety of backgrounds and disciplines who are engaged in research, writing, and teaching at Western.